Norwegian energy companies Equinor and Scatec Solar announced this week that they had completed the 162 megawatt (MW) Apodi Solar plant in Brazil, the former’s first step into the solar industry. The 162 MW Apodi Solar plant located in the Brazilian state of Ceará and was awarded in the auction process held by ANEEL, the Brazilian Electricity Regulatory Agency, in November 2015. The project signed a 20-year Power Purchase Agreement (PPA) with CCEE, the Brazilian Power Commercialization Chamber, and is expected to deliver approximately 340,000 MW-hours (MWh) of electricity annually — enough to provide the equivalent of over 170,000 households and reduce CO2 emissions of around 200,000 tonnes per year. The project was developed jointly by Scatec Solar and Equinor following an agreement made in October of 2017. The Joint Venture between the two companies built the project, and will own and operate it moving forward, as well as being responsible for maintenance and asset management. Scatec Solar is also looking to continue developing solar projects in both Brazil and South America. “We see significant potential for further growth in Brazil and other parts of Latin America, and we will soon start construction of a new 117 MW solar plant in Argentina in partnership with Equinor,” explained Raymond Carlsen. Gamesa Electric, a subsidiary of Siemens Gamesa Renewable Energy, announced this week that it has been awarded a contract to supply six solar projects to be developed in Egypt worth a total of 400 megawatts (MW). The Spanish-based solar manufacturer announced on Wednesday that it had been awarded a contract by Norwegian solar developer Scatec Solar to provide 66 of its 5MVA PV Solar Power Stations for six separate projects located the Aswan region in Egypt. The six projects will supply a total of 400 MW as part of a large-scale Power Purchase Agreement (PPA) signed between Scatec Solar and the Egyptian government. The projects are part of Egypt’s renewable energy Feed-in Tariff program that aims to deliver total solar capacity in the country between 2.3 gigawatts (GW) — 2 GW of which will be centralized solar PV projects. Gamesa Electric will supply 66 of its Solar Power Stations for a total of 132 high-efficiency Gamesa E-2.5 MVA-SB-I PV Inverters at 1500Vdc. In addition, each Solar Power Station will include an integrated step-up transformer and a medium voltage protection switchgear, and Gamesa will also supply a Power Plant Controller to coordinate the response of the PV inverters. Normally thought of in terms of its parent company, Siemens Gamesa Renewable Energy, one of the world’s leading wind turbine manufacturers, Gamesa Electric is the solar arm of a company which has been looking to branch out into solar for the last year or so. Seeking a 10% solar bifacial boost plus a 20% tracker boost over fixed monofacial panels, Maui developer Neighborhood Power is installing 10 megawatts of a new type of Canadian Solar panels in Portland, on rooftops, carports and ground sites. The micro-utility, as the company calls itself, will build, own and operate these arrays by year’s end, and has another similar 10 megawatts (MW) planned for 2019 including sites in Hawaii, Puerto Rico, and the United States, says Stephen Gates, the president of the company. The shipment of bifacial panels to Portland may be the first US commercial load of Canadian Solar’s new bifacial panel, the BiKuCS3U-PB-AG or BiKu modules. “Depending on the albedo (reflectivity) of the ground and other site conditions, daily energy yield for projects with bifacial modules can be 5%-20% higher than with conventional polymer backsheet modules. This improved yield can dramatically enhance the economics of solar system deployments,” says the manufacturer in its spec sheet. Neighborhood Power (NPC) is experimenting with the yield boost of the panels on a variety of fixed and tracking mounting structures and different ground covers types, including grass, white plastic mulch, and natural cover, says Gates. Some albedos — like snow — can raise the amount of reflected light by as much as 70%, studies show. The trackers will include both Soltec and Arctech designs, he says. This new poly bifacial solar module generates 400 watts or more on the front, plus up to 30% additional power generation from the back side albedo, increasing system yield over monofacial panels and reducing the Levelized Cost of Electricity (LCOE). The company believes that BiKu is the first poly bifacial module exceeding 400+ watt nominal front side power, a statement said. The BiKu modules will be commercially available in 2019 and pre-production orders are being accepted now, Canadian Solar said. The design of the panel helped the developer avoid cost and meet deadlines. ”When the solar industry was hit with tariffs on solar modules and steel, it seemed that rising landed costs had priced these projects out of the market,” said Gates, in a statement with Canadian Solar. “But with the additional power generated by Canadian Solar’s bifacial modules, delivered in the quantities and in the timeframe we needed, we were able to make the project economics work and bring these projects online by the end of 2018 as planned,” he said. With the new US tariffs on both steel and solar panels, Neighborhood Power was scrambling to take delivery on both the trackers and the panels, which in this case are not optimized for one another by design. “We have worked to optimize the equipment, but only field-testing will tell. We do plan to release all the data from all the sites to the public to help foster a US standard performance expectation,” Gates says. One additional advantage to the Canadian Solar bifacial panels is a longer standard than the 25-year industry average. “Canadian Solar BiKu bifacial modules are warranted for 30 years, five years longer than the industry standard, and have a lower degradation rate, which results in 20% additional yield over the lifetime of the solar module,” the company said in the statement. “When added to the additional daily bifacial yield of 5-20%, Canadian Solar BiKu bifacial modules deliver up to 44% additional lifetime value compared to conventional modules,” the statement claims. “Canadian Solar foresaw early on that bifacial technology had the potential to be a game changer in the economics of large-scale solar and set out to be a leader in the development and deployment of bifacial solar modules. Our early deployment with Neighborhood Power in the US is one proof point of our successful execution on that strategy,” said Shawn Qu, CEO of Canadian Solar. Neighborhood Power designs a solar roof that replaces traditional commercial and industrial rooftops, notes Gates. The company also is experimenting with a new third party single-axis tracker design for carports, which is a new area of business for the solar industry. NPC is a turn-key developer of solar micro-utilities that sells solar power by the kilowatt-hour to residential, commercial, municipal, non-profit and utility markets. Canadian Solar has successfully delivered over 29 GW of modules In the past 17 years to over 100 countries around the world. The company been publicly listed on NASDAQ since 2006, the company profile states. French renewable energy group EDF Renewables announced the commissioning of five separate solar PV facilities in Israel last week, worth a total of 110 megawatts (MW). A world leader in renewable electricity, EDF Renewables announced the commissioning of five solar PV plants worth 110 MW last Wednesday, projects the company hopes will help it meet the objectives of parent company EDF Group’s CAP 2030 plan which aims to double its global renewable energy capacity between 2015 and 2050 by up to 50 gigawatts (GW). The five solar plants commissioned in Israel include the 60 MW Mashabei Sadeh project, the 14 MW Pduyim project, the 13 MW Mefalsim project, the 7 MW Kfar Maimon project, and the 7 MW Bitha project. All are located in the Negev Desert in southern Israel and consist of approximately 307,400 solar panels spread across close to 130 hectares. Four of the five solar PV facilities were won in a mid-2017 tender at the lowest-ever tariff awarded in Israel of €47 ($53) per MW-hour (MWh), while the fifth project, the 60 MW Mashabei Sadeh solar power plant, was acquired at the project stage in a separate deal in 2017. The five projects now bring EDF Renewables operating solar projects in Israel up to 17 worth nearly 300 MW. EDF Renewables currently boasts 28 GW worth of installed renewable energy capacity and will look to increase that to over 50 GW by 2030 with a mixture of wind, solar, marine, and hydro electricity. If you think your electric bill is high, it’s probably nothing like what people who live in Hawaii are used to paying. Before the advent of solar power, Hawaii — like most islands — depended primarily on diesel generators to make electricity. Diesel fuel is expensive because it has to be shipped to Hawaii from refineries by sea. Add in the cost of maintenance on diesel engines that have to run 24/7 and the price of electricity is bound to be high even before things like building the distribution infrastructure get added in. According to NPR, the average retail price of electricity in Hawaii is 33 cents per kWh — just about triple what it is in many places on the US mainland. But on the island of Maui, solar power is making important strides. Last May, Maui’s first large scale solar project — South Maui Renewable Resources — came online. It is run by Kenyon Energy, which is a developer, owner, and operator of solar energy projects throughout the United States. Maui’s second large scale solar installation came online last week in near the town of Lahaina. Called the Ku‘ia Solar project, it is also owned by Kenyon Energy. It will provide up to 2.87 megawatts of solar power to Maui’s electric grid at a cost of about 11 cents per kilowatt-hour, according to a press release reported in the Star Advertiser. The company says it will not take a profit on the electricity it purchases from Kenyon Energy but will pass the savings onto its customers. The Ku’ia Solar installation is situated on 10.85 acres of land owned by Kamehameha Schools. 34% of the electricity on Maui is currently provided by renewables. The state of Hawaii has set a goal of 30% renewable power by 2020 and another goal of being carbon neutral by 2045. Because electricity is so expensive on the islands, more and more residents and small businesses are installing storage batteries to maximize the benefits of their rooftop solar systems. With its access to bountiful sunshine and constant breezes, Hawaii is an ideal candidate for 100% renewable energy. And while its is learning how to do that, the lessons learned will help drive the renewable energy revolution forward in the US and in other countries around the world. 8minutenergy, the largest independent solar power developer in the United States, announced this week that it has sold the 121 megawatt (MW) Springbok 3 Solar Farm to independent global private asset management firm Capital Dynamics. The 121 MW Springbok 3 Solar Farm is located in Kern County, California, and is the third project built in 8minutenergy’s Springbok cluster which already includes the 137 MW Springbok 1 project and the 191 MW Springbok 2 project. Together, after Springbok 3 begins construction later this year and begins operations in June of 2019, the three solar projects will supply enough electricity for the equivalent of 152,000 Los Angeles homes. 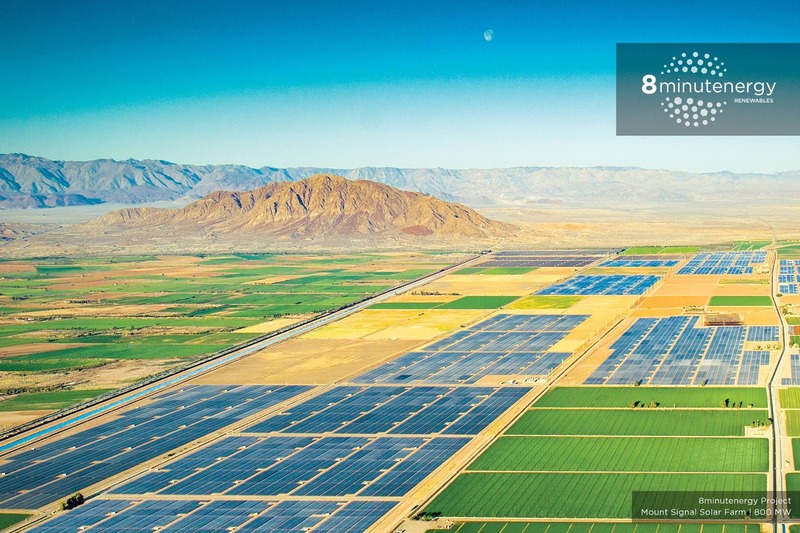 8minutenergy currently boasts 8.5 gigawatts (GW) worth of solar PV and storage under development in North America and operates over 800 MW worth of solar. 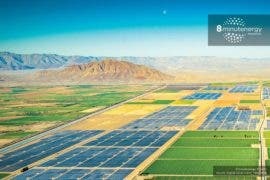 The company is also responsible for some of the largest upcoming solar plants in the world, including the 800 MW Mount Signal solar farm being built in California’s Imperial Valley. Earlier this year the company successfully energized Phases 1 and 2 of the 328 MW Mount Signal 3 Solar Farm, the third part of the project. Mount Signal 3 also involves Capital Dynamics, which in July of 2017 partnered with 8minutenergy to acquire the project. 8minutenergy previously announced last year that it had signed a Power Purchase Agreement with the Southern California Public Power Authority (SCPPA) on behalf of one of its participating members, the Los Angeles Department of Water and Power (LADWP). This acquisition marks yet another move for Capital Dynamics in a year which has already involved the acquisition of 8point3 Energy Partners, worth approximately $977 million in equity value and around $1.7 billion in enterprise value. 8point3 in February agreed to enter into a Plan of Merger and Purchase Agreement with CD Clean Energy and Infrastructure V JV, LLC, an investment fund managed by Capital Dynamics. Capital Dynamics has also closed two $1.2 billion infrastructure funding rounds this year alone. As a result, not only does Capital Dynamics manage approximately 2.3 GW worth of solar projects — including five of the 15 largest solar farms in the United States — but it now also manages approximately $4.8 billion for its clean energy infrastructure strategy. Unless you’re a fan of being kept in the dark, you need to understand how to use lighting for your daily activities. This can come through either natural or technological means. But for ecologically friendly people, nature-based and efficient methods are going to be the best. In those two circumstances converge on many different lighting options. If you want electricity from the sun, you go with solar power. If you want efficient lighting, you go with LEDs. Whenever possible, you can keep your lights on timers to save energy. And you should always note that lights at night should be faced downward to respect the night sky. Ideally, everywhere there is the sun, people should use solar power. Solar power panels are getting more efficient, less expensive, and easier to install. If people want to get away from expensive electricity that comes from coal, nuclear power, and other fossil fuels, solar energy is the way to go. Both businesses and individual homes can use solar panels. Some of the latest technology even allows you to aim panels at different points of the day for maximum efficiency. If you want to think about efficiency, using LED lighting is the best method around. LED lights are bright, energy-efficient, and highly customizable. They exist in large structures, small units, and everything in between. Many LED lighting systems are customizable and have the potential to use a remote control with them, which opens up even more avenues of energy savings. 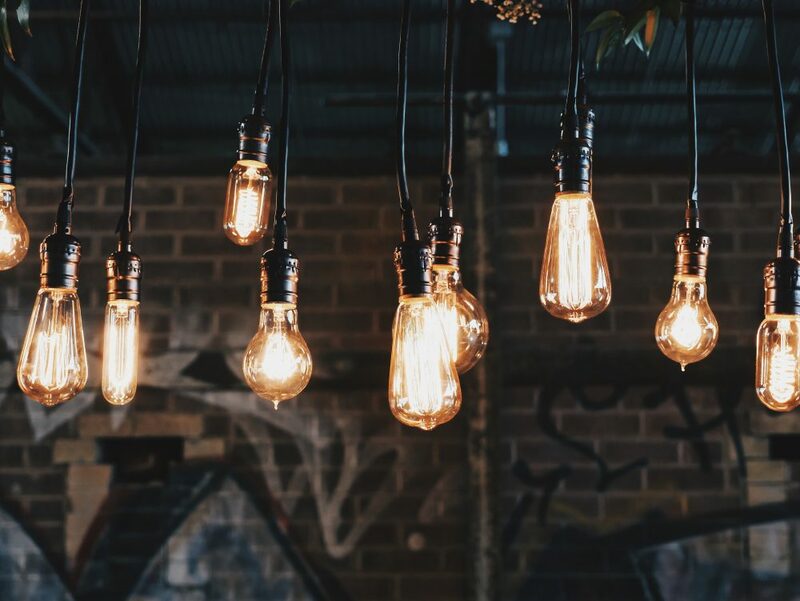 LED lighting stays cool, so there is a much lower chance of getting burned or and you’re not wasting money on the transfer of light into other forms of energy. For maximum efficiency, lights don’t have to be on when no one is home. To keep that system active and make the house seem occupied, you can just put your lighting system on a timing circuit of some sort. Some timers plug directly into outlets, but there are more advanced systems that you can purchase that sometimes even have Wi-Fi conductivity as a further benefit of their structure. If you have outdoor lighting, you should try to cover the lights on the top. Not only will this protect your lighting from the weather, allowing it to last longer, but it will also prevent light pollution goes up into the sky. Not only does this block our view of the stars and create light pollution for those in our vicinities, it’s a waste of energy; keeping lights covered allows for less light needed to brighten your specific spaces..
EnSync Energy recently announced the sale of a project under a 20-year power purchase agreement with the California Department of Forestry and Fire Protection to Standard Solar, a company which specializes in the development and financing of solar power systems. Under the agreement, EnSync Energy is constructing a 600-kilowatt solar installation at the CAL FIRE training facility in Ione, California. Scott Wiater, president and CEO of Standard Solar, answered some questions for Solar Love. 1. How did the arrangement with CAL FIRE come about? Standard Solar works with an extensive network of developers and installers throughout the entire country. The Cal Fire project was brought to us from one of our channel partners. 2. When will the solar power system be completed and become operational? The system is expected to be fully constructed and operational by the end of the year. 3. How do you help finance solar power projects? Standard Solar is able to support with financing in a wide variety of ways depending on the stage of the solar project development. For example, on early stage project developments, we can work with partners to craft the ideal financing proposal for the host-customer and fund every step of the way through to construction and operation. We also come across late-stage projects that are fully contracted with host-customers and in many cases under construction. In these situations, Standard Solar can provide financing to acquire the solar project facility and serve as the long-term owner/operator of the system. Because Standard Solar is utilizing in-house funds, it provides us the flexibility to focus on providing value throughout the full range of the solar project development cycle. 4. Are you working on other solar power development projects in CA? Yes, given that California continues to be the leading solar market in the US, our focus on increasing our operational footprint in the California market remains a top company priority. We have more than 100 MWs of projects under evaluation, in active development, or under construction in the California market. 5. What is the company roadmap for the next 3–5 years? Our goal over the next 3-5 years will be continuing to identify and execute on renewable projects that will allow our parent company to diversify their generating asset mix that deliver a healthy return on investment. We have dedicated capital resources that exceed $600 million which can be increased should the demand for financing exceed this amount. 6. Why is providing a range of financing for solar power projects important, and is it even more so right now due to the economic and policy conditions? Solar projects are a lot like fingerprints — each one is unique. To be a strong player in the solar industry, you have to be able to reach your clients where they are, whether that’s through a loan, a lease, a power-purchase agreement (PPA) or some other creative financing deal. Being a one-size-fits-all financing institution isn’t going to lead to success. And with today’s tumultuous economic and policy conditions, flexibility is paramount if you want to make sure you get projects done and get them done in ways that are financially advantageous to everyone involved. 7. What are some other new projects you are working on right now you are excited about? Right now, we are most excited about our expansion into new states and emerging markets (we are now contracted, constructing, or operational in over a dozen states). Our competitive financing coupled with our channel partnership approach allows us to remove regional market barriers and widen our pool of renewable asset opportunities. IBC SOLAR, a global leader in photovoltaic (PV) systems and energy storage from Germany, has completed a 27 megawatt (MW) solar plant near Kesinga in the Indian state of Odisha. For IBC SOLAR, this is its largest project to date as well as its first project in Eastern-India. And it shows how fast things can change to clean energy from the sun. On my November trip to India, New Delhi and other areas there had big smog troubles. The new solar park has been finished one and a half years after the decision from the auction to getting the first megawatt to grid. While states like Rajasthan, Telangana, and Andhra Pradesh already have a large share of solar power, with more than 2 gigawatts installed capacity each, the state of Odisha lags behind with approximately 90 MW installed capacity (by autumn 2017) and has only recently begun to try and pick up speed. With the newly connected PV plant, IBC SOLAR is supporting Odisha to increase its share of solar power by around 30%. This is an important step for the economic development in Odisha and, in particular, for the district of Kalahandi where the new solar plant is situated. Shailendra Bebortha, Managing Director of IBC SOLAR in India, explained that this project will put Western Odisha prominently on India’s solar map. He also expressed his thanks to all the Contractors, State Government departments, Solar Energy Corporation of India (SECI), lenders and local public for this huge success. IBC SOLAR´s project is part of a 270 MW PV tender floated by SECI in the state of Odisha in August 2016. As a result, a 25-year Power Purchase Agreement (PPA) was awarded to IBC SOLAR through a competitive auction process. Project financing was concluded with L&T Infrastructure Finance Company Limited in March 2017. Following the securement of 111 acres of land in August 2017, the local electric power transformation substation had to be upgraded to manage the soon-to-be generated energy, a transmission line for approximately 8 kilometers long was built, and construction of the solar plant then started in November 2017. “With this project, we have consolidated a strong know-how in project development, land securitisation and grid connection in Odisha, a state with a high potential for solar PV build-up”, says José María Llopis, CEO of IBC SOLAR Energy GmbH. It is not only the company’s largest single location plant, but also its first project in India that was fully developed, financed, constructed and commissioned by IBC SOLAR alone. The solar plant meets the high-quality standards of IBC SOLAR as well as it fulfills stringent international standards of health and safety. It’s the best role model to build more of in the near future, and another big step for the company, which has a success-story more than 35 years in the making, including a full range of solar energy, from e-mobility charging to solar parks like this one in India. The 270 MW from Odisha is small compared to Tengger Desert Solar Park, the world’s largest photovoltaic plant. It is located in Zhongwei, Ningxia, China. It covers an impressive area of 16,6 mi² (43 km2 ) – that is one tenth of the size of Vienna – and produces 1,547 MW. However, many small steps into a clean-tech-future are good news for India and for our environment. Just weeks after the Indian government exempted import solar modules from custom duties, the impact of the decision was seen in the substantial fall in tariff bids. The latest auction completed by India’s largest power generation company — NTPC Limited — for a large solar power park in southern India saw developers reducing tariff bids by around 9% compared to bids seen in auctions just before the custom duties were repealed. NTPC Limited had offered developers 750 megawatts of capacity at Ananthapuram solar power park in the state of Andhra Pradesh. As per the tender conditions, developers could bid for a minimum capacity of 50 megawatts and maximum of 750 megawatts. Against an offered capacity of 750 megawatts, a total of 11 developers submitted bids to set up 3,500 megawatts of capacity. Nine of these developers submitted bids to develop 250 megawatts each, one proposed to set up 500 megawatts, while one another bid for the entire 750 megawatt capacity. The oversubscription of the tender is good news for the Indian solar power market. Auctions for at least two large tenders were postponed multiple times over the last few months as they did not receive enough bids to cover the entire capacity on offer. Karnataka Renewable Energy Development Limited (KREDL) had offered 1,200 megawatts of capacity at Pavagada solar power park. Even after multiple postponements the tender managed to attract bids for just 550 megawatts. These projects, won by ReNew Power, Azure Power, and Avaada Energy, received bids of around Rs 2.93/kWh (4.35¢/kWh). The state of Gujarat also auctioned 500 megawatts of capacity earlier this year. Bids for these projects ranged from Rs 2.98 to Rs 3.06/kWh (4.42¢ to 4.54/kWh). Another state, Maharashtra, offered 1 gigawatt of capacity last year and had been forced to postpone the auction multiple times as it did not receive enough bids to cover the entire capacity. Gujarat cancelled the auction, stating that the tariff bids were high. It plans to hold the auction again soon. Now, finally, Maharashtra has received enough bids to cover the entire capacity on offer. A total of eight developers have proposed to set up 1,450 megawatts of capacity. The actual auction is expected to take place soon now. In the NTPC tender for Ananthapuram solar power park, Sprng Energy, Ayana Renewable, and SB Energy secured rights to develop 250 megawatt capacity each. These companies won these projects at tariff bids of Rs 2.72-2.73/kWh (4.02-4.05¢/kWh). That is a decline of around 7% compared to KREDL bids and 11% compared to Gujarat bids.